Everyone knows we should all eat more salmon and other fatty fish for our health. Here's the bonus: it's delicious too! Whether you use salmon steaks, fillets, or canned salmon, these quick and easy five ingredient salmon recipes will help you get a satisfying dinner on the table in a hurry. Even people who don't like fish will enjoy these simple recipes. Salmon pairs beautifully with fruit, vegetables, mustard, honey, and every spice and herb in your kitchen. And you can mix and match these recipes with just about any side dish. Potatoes, rice, polenta, grilled bread, and green salads are good choices, as are fruit salads and pasta. Enjoy these easy recipes. Pairing a rich meat like salmon with a fresh and slightly sweet salad is a great combination. You can use strawberries or raspberries in place of the cherries if you'd like. Adding a glaze to salmon helps cut through the richness and makes a beautiful presentation. This wonderful recipe takes about 20 minutes, start to finish. I've always loved fried rice. And this recipe, with starts with cold cooked rice or a pilaf, is super simple and fast. You can use leftover cooked salmon or drained canned salmon in this winner. This wonderful and easy recipe has great flavor and takes about 15 minutes, start to finish. When I learned how to cook salmon in the crockpot, my life changed. Really! The crockpot's moist and gentle cooking environment is perfect for this fish. Couscous flavored with lemon is a delicious accompaniment to salmon fillets. The crockpot is also perfect for poaching salmon. You can season the poaching liquid any way you like; this is my favorite flavor combo. This gorgeous recipe is so good for you and so delicious. I often add an extra avocado when they're perfectly ripe just because it's so good. Sprinkle salmon with a couple of seasonings and quickly roast it for a wonderful taste sensation. Dill and salmon are natural partners. This simple recipe is ready in about 40 minutes. Salmon is cooked in a foil packet to keep it moist and tender. This beautiful recipe is perfect for entertaining. 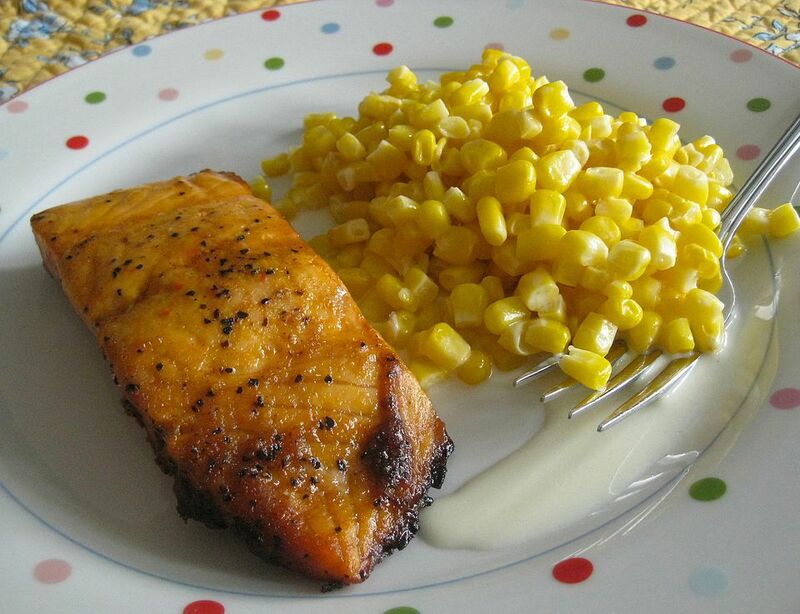 The sweet sauce is the perfect foil for the tender salmon. Grilling salmon adds another layer of smoky flavor. This was one of the first salmon recipes I ever made. And for a last minute treat, mix leftover or canned salmon with coleslaw, either homemade or from the deli. The Sea Cucumber: Food, Medicine, or Aphrodisiac?